Looking for a way to get to know your students better? This worksheet provides the perfect opportunity for your students to share some information about themselves that you otherwise may never know! 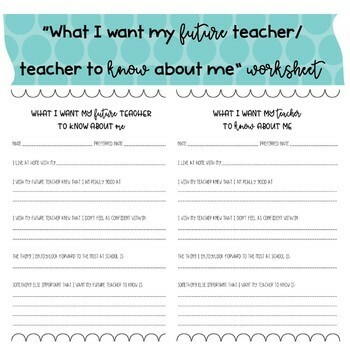 Two worksheets come with this listing: "What I Want My Future Teacher to Know About Me" and "What I Want My Teacher to Know About Me". This would be a great end of the year activity to pass along to next year's teachers or a great start of the year activity to get to know your new students!